You are here: Home » Designing an Elective Course || Photography, Anyone? Designing an Elective Course || Photography, Anyone? Teaching high school at home enables your teen to choose from a limitless number of elective course options. There is an abundance of curriculum available in many different subject areas. But if you can’t find pre-packaged materials, consider designing a course from scratch. As an example, let’s design a photography course! I did a quick internet search and found many interesting websites that offered a wealth of ideas, lesson plans, and even an online photography course. >> Nikon has some learn and explore items on its website. >> I don’t have any first hand experience with these photo classes, so I cannot recommend them, but this website may be one for you to explore. It offers 30 day photography classes for a reasonable fee. 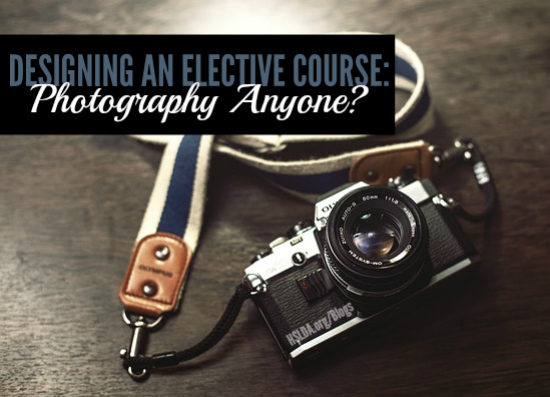 >> This homeschool photography course also looks like a good one to explore. I hope these resources provide you with a good starting place to design a photography elective or check out online course alternatives for your budding teen photographer..
Photo Credit: Photo via Pixabay, graphic design by Charity Klicka. ← CLOSED | GIVEAWAY – Building the Machine Extended DVD is Here!